When I started drawing this map, the big statue at the center of the main hall became a sort of a center piece for the whole map. I did not come up with a clear story for this map, but instead added various features that might offer different uses for this map. Perhaps there are creatures living in the cave that pose as the deities that the temple was originally built for. Or maybe an earthquake has disturbed the magical balance of the tomb and something has woken. Or perhaps a cult is conducting their vile necromantic rituals and corrupted this tomb? 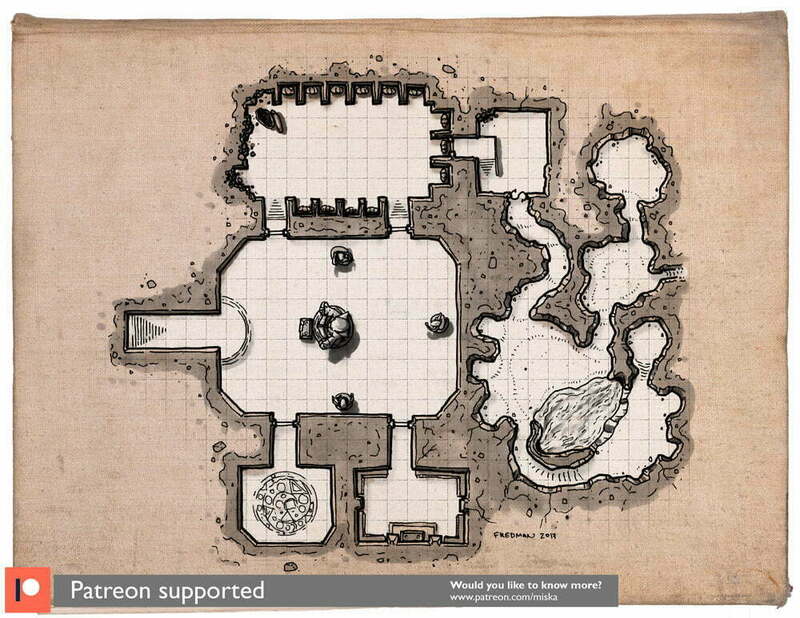 This map was originally published on Patreon with the support of my awesome patrons in September 2017. Thanks for making this map! I think it would make for a wonderful earthquake-buried tomb shrine, complete with “imprisoned” lich and statue guardian.